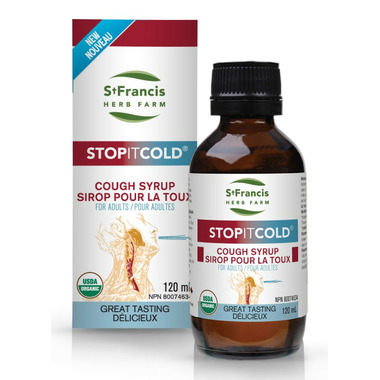 St. Francis Herb Farm STOPITCOLD Cough Syrup is used in Herbal Medicine to help relieve symptoms of colds and flu (such as coughs of the upper respiratory tract). Suggested Use: Adults: take 5ml (1 tsp), 3 times daily. Take a few hours before or after taking other medications or natural health products. Cautions and Warnings: Consult a health care practitioner before use: if you have a cardiac or respiratory disorder; if you are using tobacco products or are taking lithium. Consult a health care practitioner if symptoms worsen or persist. Do not use: if you are pregnant or breastfeeding; if you have high blood pressure or a digestive disorder; if you are suffering from infectious or inflammatory gastrointestinal conditions. Hypersensitivity (e.g. allergy) can occur, in which case, discontinue use. Discontinue use in case of gastrointestinal upsets, such as abdominal cramps, nausea, vomiting, diarrhea or if dizziness, increased respiratory rate or tremors occur. Diuretic effect may occur.